Waking up on Day 3 of our road trip we were greeted with another sunny day. The weather gods were smiling upon us so we took advantage and made our way to one of the highlights of our trip, Plimoth Plantation. Plimoth Plantation is a recreation of the original Plimoth Colony in Plymouth, MA. It features the "plantation" or settlement, a Wampanoag homesite and artisans who work in in the style of the 17th Century. The settlement and homesite feature actors in period dress playing historically accurate characters. To be honest, everyone was excited about it. The kids had all studied it in school and Karen and I had both read Nathaniel Philbrick's fantastic book "Mayflower." To a person, adults and kids, we were all looking forward to it. The only thing I wasn't looking forward to was eating there. We have all been to enough museums and cultural institutions to know that their food is, in general, terrible. That is why I believe the single best part of the MOMA renovation was the Cafe on 2. More on that in a later post. I had done a little research and had scoped out a few potential lunch spots in the town of Plymouth. But the timing did not work out in my favor. We got a later start than expected, and the trip took a little longer than expected, so that by the time we arrived it was close to noon and the natives were getting restless (and hungry). I jockeyed for a run into town, but our friends were driving back to New York after our visit and they did not want to get a late start. I looked at my wife and said, trying my best to keep my language clean, "OK, let's look at the food here. But if it is just chicken fingers, pizza and crappy Chicken Ceasar Wraps we are out of here." A Taste of History. 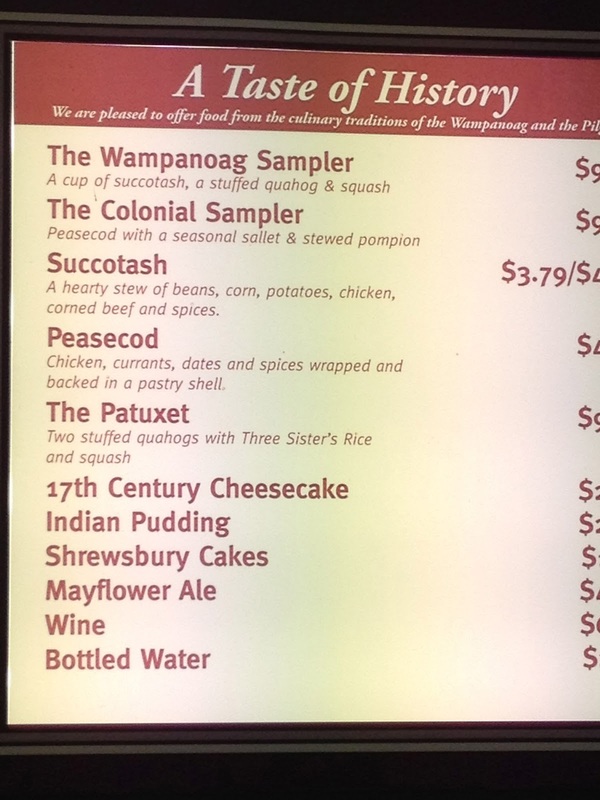 Traditional food of the Wampanoag and Pilgrims. Now, I can't say I had high hopes. But I figured it had to be better than the standard fair and would at least get me in the spirit of the day. So we stayed and ordered. The kids ordered what kids order. No surprise. Karen joined me in the culinary adventure and ordered the Succotash. I rolled the dice twice and went with The Patuxet and the Peasecod. First, Karen's Succotash. If you had asked me before this lunch what, exactly, succotash was, I couldn't have told you. Of course I knew that it was a part of Sylvester's favorite phrase "suffering' succotash" (Daffy said it occasionally as well). If I had thought about it, I would have guessed that succotash was some kind of squash. It turns out succotash is a hearty stew. 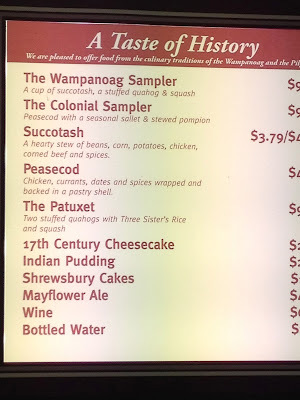 The Plimoth version has beans, corn, potatoes, chicken, corned beef and spices. It was hearty and tasty. Karen was very happy with it and I was happy she shared. Next up was the Patuxet. Two large stuffed quahogs (clams) with a side of Three Sisters rice and squash. The stuffed clams were huge, overflowing with stuffing. It was mostly breading and seasoning but there were enough clams in it to give it a satisfyingly briny taste. They weren't the best stuffed clams I have ever eaten, but they were good and filling and I enjoyed them. Better than an ice cold Chicken Caesar Wrap any day. The side of rice was nice and Karen enjoyed the squash. Last up was the Peasecod. We have a winner. A Peasecod is a hand pie. Chicken, currants and dates are chopped and mixed with spices then wrapped and baked in a pastry shell. This is the original Hot Pocket, and unlike the Hot Pockets of today, it was delicious. The spice blend had a surprising South Asian flavor to it. It mixed well with the sweetness of the dates and currants and resulted in a sweet and savory pie that I truly enjoyed. I would recommend it if was sold from a store front on 1st Avenue, so on a visit to the Plimoth Plantation consider it a must try. Fully satiated from our lunch we headed out to enjoy some living history. The first stop was the Wompanoag Village. We learned how the they made boats, cooked and lived. We had a great host in the long house who answered all the kid's questions. Next up was the Craft Center where a potter was at work and well as a craftsman making a traditional bow and arrows. Finally we made our may to the Plantation. Sitting on a hill, with the view of water, you can really get a feel what it was like for the early settlers. You can enter all the houses and talk to the actors who are playing actual settlers, like Miles Standish, from the original Plimoth settlement. They are knowledgable and will answer all your questions. As you wander through Plimoth, you can imagine the hardships the Pilgrims went through. That they ultimately survived and prospered is remarkable. It took great courage and conviction to travel so far from home to start a new life. It also required help from the Wampanoug people. I do take comfort knowing that, once settled, they were able to build a new life and enjoy the fruits of their labor. After a day's hard work they could settle into the comfort of a home they had built with their own hands and enjoy a nice bowl of succotash or a peasecod. 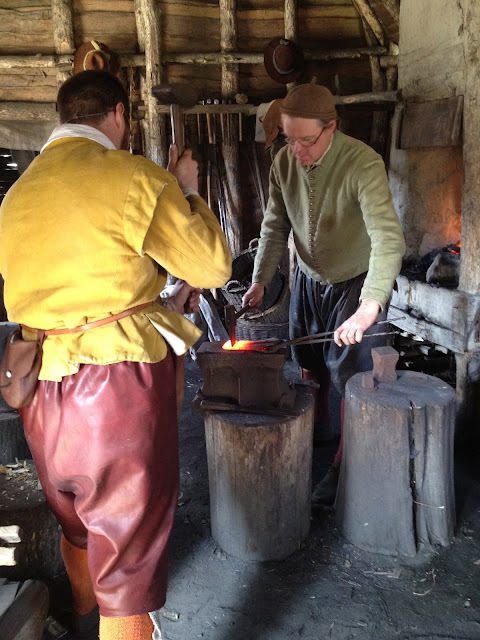 Plimoth Plantation is a great destination for families or anyone interested in American history. Even the most jaded of us cannot help but be captivated by it. It makes you realize just how far we have come as a people and as a nation. Today's Hot Pockets not withstanding. If you want we can write persuasive essay about pilgrims and American history. Join our group. Big Poppa hits the road.